These are not visible in the mirror. An extensive workout is needed for results to show. They are unable to contract or feel this part of the body, during the workout. The exercises mentioned below aim at the complete development of back muscles. Therefore, all these exercises can be included in your workouts. However, ensure that these are performed correctly and under the guidance of a qualified trainer. Not recommended for people having back issues. Never slouch the back forward, as this may cause back injury. In case of doubt, use less weight instead of more. This is your starting position. Holding the barbell with the palm facing down, bend your knees slightly. Bring your torso forward, by bending at the waist. Keep the back straight until it is parallel to the floor. Ensure that the head is kept up. The barbell should hang directly in front of you, while your arms hang perpendicular to the floor and torso. Keep the torso stationary, breathe out and lift the barbell close to you. The elbows should be close to the body, and you should only use the forearms to hold the weight. At the top contracted position, squeeze the back muscles and hold a brief pause. Inhale and slowly lower the barbell to the starting position. Do not let the barbell touch the floor in between the repetitions. 4 sets of 8-10 repetitions are enough. Train heavy but don’t train to failure. Rest for at least 2 – 3minutes between each set, so that you have maximum strength and power. Attach suitable weights to your barbell and bend down at the waist. Bend your knees. Hold the barbell with arms shoulder-width apart and palms facing down towards the floor. Now, slowly lift the barbell and straighten your entire body. Pull your shoulders backward and hold the position for a few seconds. Gradually, lower the barbell to the floor. Perform 3 – 4 sets with 8 – 10 repetitions. It’s safer to use a T-Bar machine which offers a chest support. Step on the platform with your feet shoulder-width apart. Bend your knees slightly. Keep your back straight and bend forward at an angle of 45 degrees with the floor. Grip the handles and lift using the middle back muscles only. Squeeze the middle back position and return the weights back. 3 – 4 sets with 10 repetitions would suffice. Don’t lean your back during this workout, as this will involve your lower back instead of the lats. Fix proper weights to the pulley and then attach a straight bar to it. Sit on the lat machine and then hold the bar. The distance between your arms should be wider than your shoulder width and your palms should face in the front. Stretch your arms completely upwards, and let your lats stretch to the fullest. 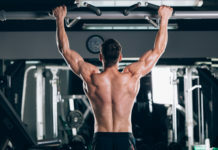 Pull down using your lat muscles, until the bar touches the top of your chest. Maintain this position for a few seconds, and then slowly release the bar upwards to regain the original position. Do 3 – 4 sets with 8 – 10 repetitions. Adjust to pull-up frequency to avoid body swinging. Don’t use momentum. Ensure that your knees are slightly bent. Hold the overhead bar with your arms wide apart. Start lifting yourself until your chin passes the level of the bar. Hold this position for a few seconds, and then slowly descend to the original position. Do about 3 – 4 sets with 8 – 10 repetitions. Try to feel your back muscles during each of these workouts. If you don’t, then you are using too much weight. Reduce the weight, as these are bodybuilding workouts and not weightlifting. The aim is to get the back muscles to do as much work as possible.